The ultimate healthy winter side dish, roast up a pan of roasted root vegetables flavoured with fresh sage and olive oil and enjoy them all week. 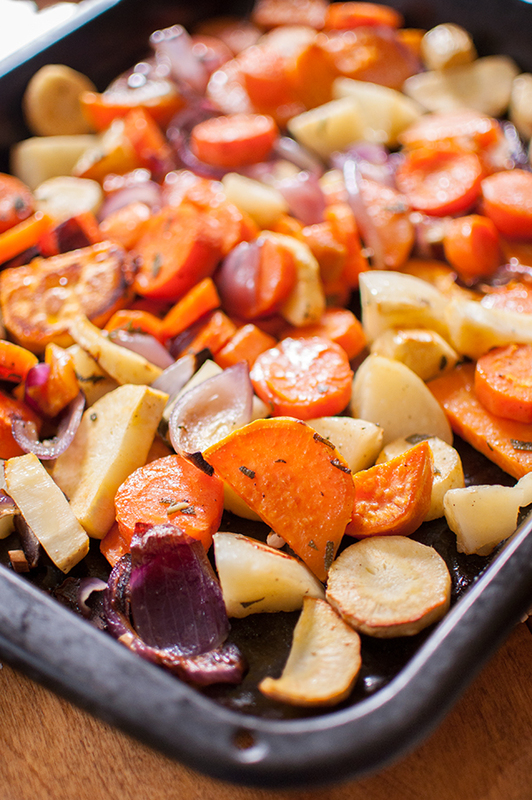 It doesn’t get much simpler than roasted root vegetables, does it? This is the quintessential side dish for the winter. You could serve these roasted vegetables to me every single weekend and I would not be tired of them. Please tell me that I’m not the only one who is craving all things simple these days. I know, I sound like a broken record; I always talk about simplicity. But what can I say, Life. Is. Complicated. It’s like all of a sudden, every single thing has decided that right now is the perfect time to veer to the left. Or to the right. Basically, whichever direction would throw me off the most. First there’s that email that sends you into a panic. The one you didn’t see coming at all and all of a sudden it’s time for some serious damage control. Then there is that due date that is looming much closer than you thought. Then there is a little bit (ok, a lot) of miscommunication. Never mind those few people with just a few too many prodding questions. And let’s not forget that person with all of those unnecessary expectations that weigh so heavily on you and leave you feeling completely drained and empty. Don’t you just love all of that that? And, exhale. I know you can relate, please tell me I’m not alone. Now, because I’m a glass-half-full kind of girl, I’ve channeled my craving for simplicity into something a little healthier than simply ranting here on this food blog. I’m exploring my longing for simpler things in life through a “Back to Basics” series over on Carly’s blog, The College Prepster. Hence this incredibly basic recipe that everyone should have in their cooking repertoire for roasted root vegetables. This is one of those recipes that will help to give you confidence in the kitchen. And I’ve been sharing more simple, fresh and flavourful recipes over there. Today I’m focusing on my favourite fall roasted vegetables. I’m continuing my love affair with the earthy herb sage. I find that sage is the herb to use during fall cooking, it’s aromatic yet understated and its earthy elements and pair so beautifully with roasted turkey and all the Thanksgiving fixings. That reminds me, these roasted root vegetables also happen to be a great side dish to bring for Thanksgiving. Their flavours intensity and the sugars in the vegetables caramelize with the heat, creating a complex, and slightly sweet side dish. If you’re craving either: a) simplicity b) vegetables c) healthy comfort food d) anything with sage e) all of the above This is the recipe for you. And if you are indeed craving anything with sage, you might also need to try my brussels sprouts roasted with sage or my favourite, sage pork chops. An incredibly simple and healthy side dish, toss wintery root vegetables like carrots, parsnips and sweet potatoes with fresh sage and olive oil. 2 carrots, sliced into 1/2" half moons. Toss vegetables and garlic with olive oil. Sprinkle with sage leaves. Season with salt and pepper. Dump onto roasting pan, and cook for 30 minutes. 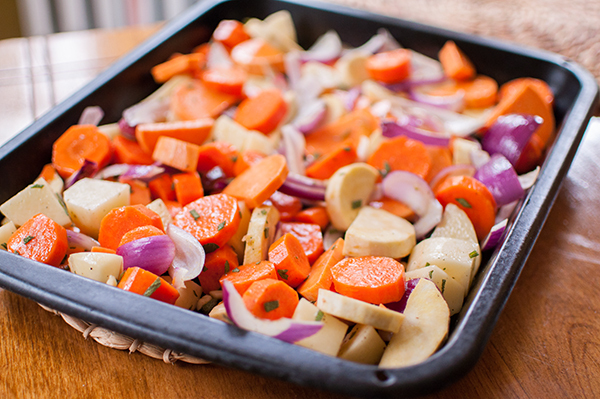 While you may not need a recipe for a simple side dish of roasted root vegetables, for any beginning cook these healthy roasted vegetables are a great place to start. Wow those look amazing! I totally agree with the need for simplicity- life can get so hectic sometimes. It's great to have a reminder to take a step back and breathe.I'm excited to try this recipe- thanks for sharing!! I am totally, 100% with you. When life is complicated food needs to be simple and comforting. And there is NOTHING more comforting than a bunch of hearty veg, pulled from the earth roasting away in the oven. Looks delish! Sweet potato is my fav. Thank you, they really are the perfect combo!